Expected to triple throughout the American marketplace in a span of five years, the driving principles behind the modern food hall are authenticity, quality and celebration of food culture. These principles tend to be the complete opposite of the traditional American food court, which focus on fast-food mantras of familiarity, predictability and mass production. The most successful food halls also tend to contain interactive layouts by hosting live entertainment and social events, which allows consumers to experience the space in a variety of ways. Northeast Florida’s first food hall, Gilbert’s Food Hall, comes with celebrity-chef branding. Chef Kenny Gilbert is best known for his appearance on Top Chef season 7, where he was voted Fan Favorite. Throughout his career, Gilbert has traveled the world, staging in some of the top restaurants in Japan, Spain, France and the Caribbean. Gilbert has also crafted dishes for celebrities including Oprah Winfrey, Stedman Graham, Ava Duvernay and Jeff Bezos. In March 2015, he opened Gilbert’s Underground Kitchen in Fernandina Beach, Florida with his wife Anna, serving seasonal deep Southern cuisine. In October 2016, the pair opened their second restaurant, Gilbert’s Social in Jacksonville, serving internationally-influenced Southern fare. Although there are variations in size, most food halls range between 10,000 and 50,000 square feet. At 9,345 square feet, Gilbert’s Food Hall is considered a mini food hall. The mini food hall, typically 10,000 square feet or less, is a relatively new trend in the industry that has emerged since 2015. 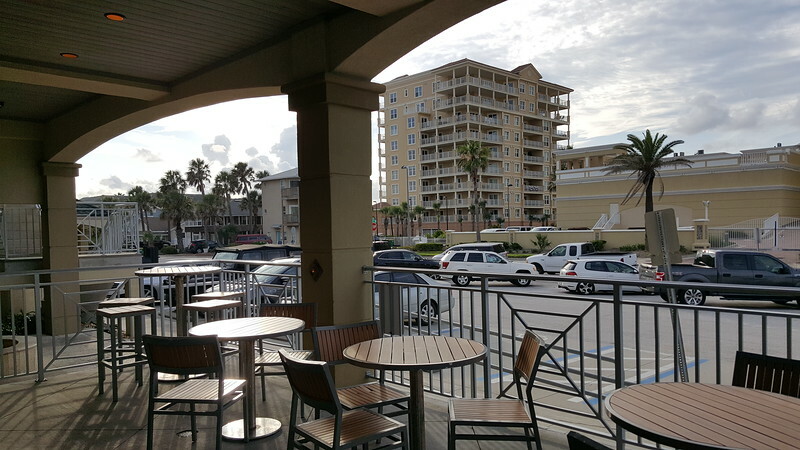 Located at 831 1st Street North in Jacksonville Beach, Gilbert’s Food Hall opened its doors in January 2018 with four concepts operating within the two-story oceanfront structure. Gilbert was approached by Jim Franks, owner of the Seachasers restaurant, to partner and rebrand the venue. Gilbert agreed, wanting to remake the restaurant and give it a positive vibe. 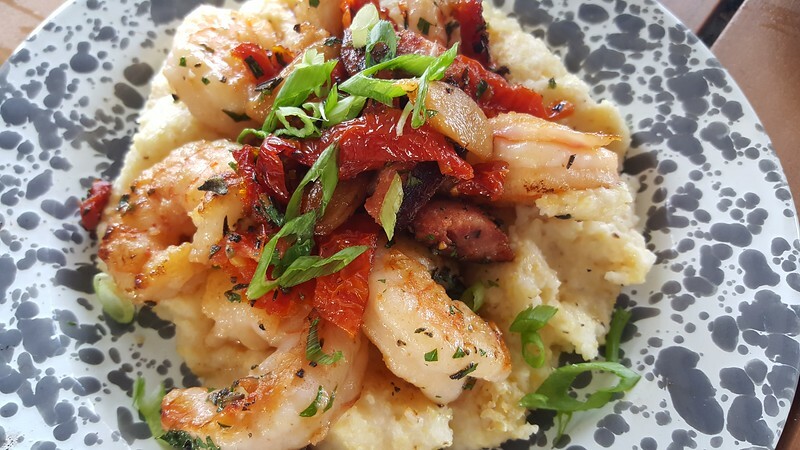 His makeover provides Jax Beach with not just another Southern restaurant to grab a quick bite, but provides four different spaces to enjoy Southern food and drink all inside the same building. For the beachcombers, there is Gilbert’s Beach BBQ Tacos & Beer, a pop up concept slated to remain open through Labor Day 2018. For those who are low key and want to kick back, eat and drink, there is Gilbert’s Hot Chicken, Fish & Shrimp. 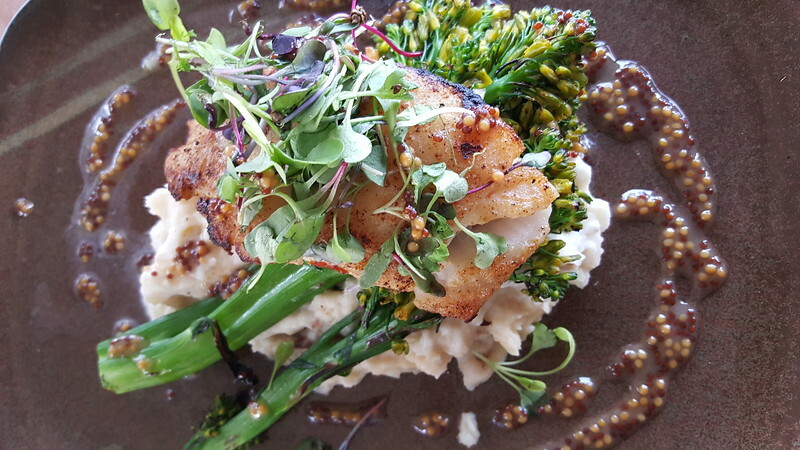 For those who want to enjoy a modern Southern meal with beachfront views, there is Gilbert’s Southern Kitchen & Bar. 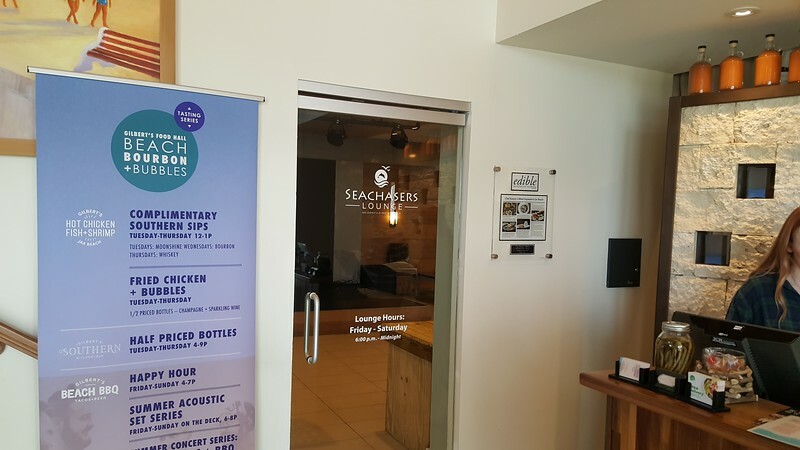 And for those who enjoy late nights with great cocktails, there is Seachasers Lounge. Gilbert wanted to “do something that no one else is. Something that stays true to what [he’s been] doing since [he] opened the Underground 3 years ago,” as he described the project. Gilbert, who grew up in a family who was passionate about cooking, has stayed close to his favorite style of cooking in this venture: Southern. 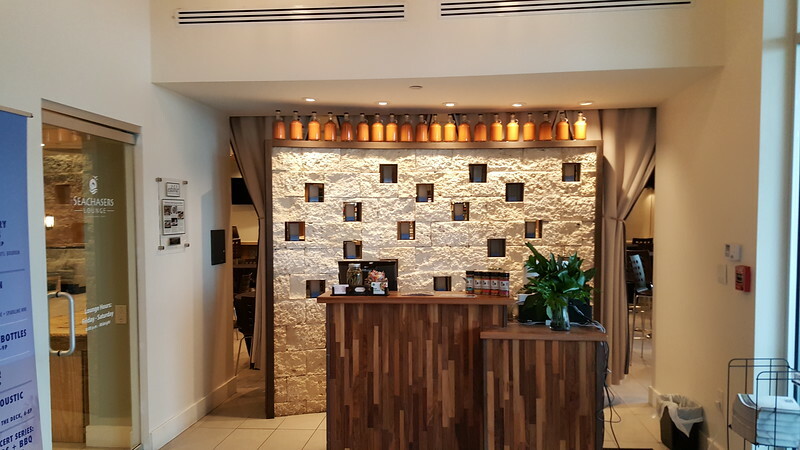 Overlooking the Atlantic Ocean, the menu at 80-seat Gilbert’s Southern Kitchen & Bar has an emphasis on seafood and barbeque with a bar program featuring moonshine, whiskey, and bourbon. Occupying a downstairs space, the 60-seat Gilbert’s Hot Chicken, Fish & Shrimp features all that its name embodies - Nashville style hot chicken, fish, and shrimp. Meats on the menu include Smoked Boneless Chicken Thighs, 24 Hour Brined Birds, Catfish Fillet, Local Wild Shrimp, and as a vegetarian option, Fried Southern Vegetables and Tofu. Signature sandwiches served on sweet buns include the Smoked & Fried Chicken Sandwich and the Farm Raised Texas Catfish Sandwich. In addition, there are 20 rotating draft lines featuring craft beers such as Dukes Brown Ale from Bold City, Jon Boat from Intuition Ale Works and Pineapple Wheat from Maui Brewing Company, and standard favorites like Guinness, Sweetwater 420, and Yuengling. A third space within the building, Seachasers Lounge, hosts live music two nights a week and features Gilbert’s bar snacks including Pimento Cheese, Fried Chicken Skins and Raging Cajun Boiled Peanuts. Gilbert’s Beach BBQ Tacos & Beer is the latest concept to open at Gilbert’s. This pop up concept serves barbecue, tacos, smoked meats, beers, cocktails, and desserts in a first floor patio space overlooking the Atlantic Ocean. Future plans include adding ramen and congee concepts into the multi-use space which is designed with Southern and beachfront influences. Gilbert’s Food Hall serves as a local example of a popular shared economy dining concept that continues to explode across the country. By 2020 it is predicted that 300 major food halls could be operating in the United States, nearly doubling the total number in 2017. If this comes to pass, Gilbert’s may be the introduction of a major restaurant industry trend that may ultimately engulf and reshape Jacksonville’s dining and entertainment scene.